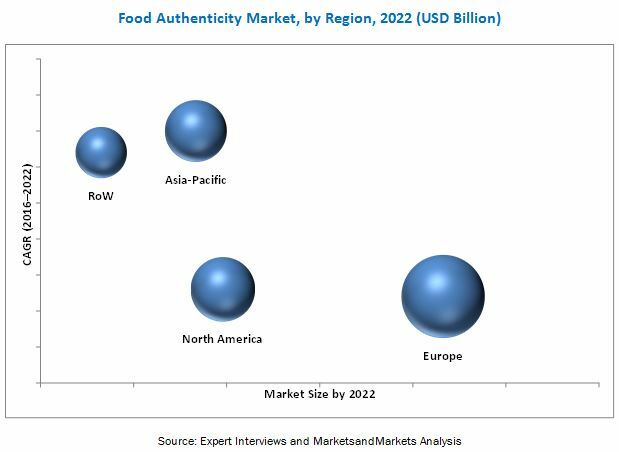 [207 Pages] The food authenticity testing market, in terms of value, is projected to reach USD 7.50 billion by 2022, at a CAGR of 7.6% from 2016 to 2022. The growing international trade is one of the factors driving this market as compels the manufacturers to comply with the global mandates and regulations for food authenticity due to the growing economically motivated adulterations (EMAs). As international trade increases complexities in the supply chain and the chances of cross-contamination and fraud, the demand for food authentication services is projected to remain high. The market research is carried out through secondary sources, such as World Authenticity Organization (WAO), Codex Alimentaurius Commission (CODEX), Centers for Disease Control and Prevention (CDC), The European Federation of National Associations of Measurement, Testing, and Analytical Laboratories (EUROLAB), and Food and Agriculture Organization (FAO), while their market share in respective regions were determined through both, primary and secondary research. The research methodology includes the study of annual and financial reports of top market players as well as interviews with industry experts (such as CEOs, VPs, directors, and marketing executives) for key insights (both, quantitative and qualitative) for the food authenticity testing market. This research report categorizes the food authenticity testing market based on target testing, food tested, technology, and region. The food authenticity testing market size is projected to reach USD 7.50 billion by 2022, at a CAGR of 7.6% from 2016 to 2022. Growing awareness among consumers about food authenticity and regulations is one of the major factors driving the market for food authenticity testing. Rising concerns pertaining to food authenticity among consumers has been witnessed over the last few decades. To align with the growing requirements of the consumers, leading manufacturers are focusing on improving the quality & safety of food products through labels, claims, and nutrition facts. The food authenticity testing market, based on target testing, is segmented as meat speciation, country of origin and aging, adulteration tests, and false labeling. The adulteration tests segment is projected to be largest, and the meat speciation segment is projected to be the fastest growing in the food authenticity testing market through 2022. The increasing number of food frauds due to the complexity of the supply chain also contributed to the market growth. The food authenticity testing market, on the basis of technology, is segmented into PCR-based, LC-MS/MS, isotope methods, immunoassay-based, and others, which includes NMR spectroscopy, test kits, and chemical tests. The PCR-based technology witnesses an increased use in food authenticity testing. It is a molecular technique that uses DNA for the analysis of meat and food products, providing precise results on testing. The technology amplifies fragments of DNA extracted from the food product samples to accurately identify the DNA of each species in the product. This enables cross-checking of the product’s authenticity and confirmation of product claims. LC-MS/MS represents the second largest technology segment in the market. This technology is used to detect the authenticity in the food products as well. 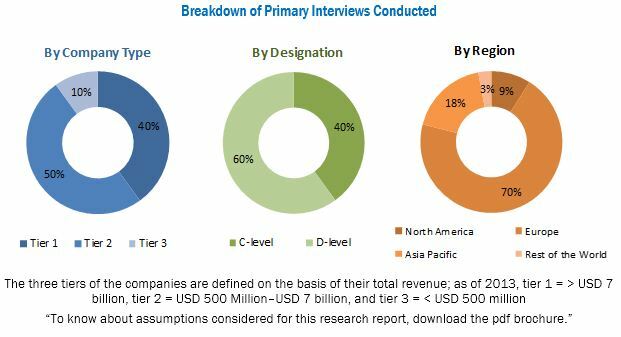 The testing market through PCR-based technologies is largely driven by its wide applicability, accurate determination of adulterant, meat species or GMO in products even at 0.1% levels of detection. The food authenticity testing market, based on food tested, is categorized into meat & meat products, dairy & dairy products, processed foods, ingredients, cereals, grains, and pulses. The processed food segment is projected to be the largest segment, whereas the meat & meat products segment is projected to witness the fastest growth in the market. The growth of the processed food segment is attributed to a wide number of processing applications of products such as infant formula, packaged food, wine, and other processed food products. Due to the increasing fraud and counterfeit instances in processed food products, the demand for the food authentication testing services remains high in this segment. On account of these factors, the processed food segment is projected to be the largest in the food authenticity testing market. The food authenticity testing market was dominated by Europe in 2015. The food authenticity policies have been strengthened by the contributed efforts from National reference laboratories (NRLs), EU Reference Laboratories (EURLs), and European Academy of Allergy and Clinical Immunology (EAAACI). Implementation of food safety regulations, increasing number of consumer complaints, and labeling compliance have driven the food authenticity testing market in Europe. Asia-Pacific is projected to be the fastest growing food authenticity testing market. The increasing number of international trade for food materials in the North American countries, such as the US has compeled the manufacturers to comply with the labeling requirement and authenticity confirmation in the foods. The lack of food control infrastructure & resources in developing countries, the complexity of testing techniques, and lack of harmonization of regulations are the restraining factors in the food authenticity testing market. Some of the leading players include SGS SA (Switzerland), Intertek Group plc (U.K.), Eurofins Scientific (Luxembourg), ALS Limited (Australia), and LGC Science Group Ltd (U.K.). In June 2015, Eurofins Scientific launched a new DNA chip technology analytical method, which would detect and identify 21 animal species in feed and food products simultaneously. In May 2014, Eurofins Scientific acquired ViraCor-IBT Laboratories, Inc. (US), which provided biological and large molecular biomarker support; its testing facility included quantitative and qualitative PCR, DNA sequencing, ELISA, and other immunoassay platforms. Intertek Group plc (UK) is one of the leading food authenticity testing service providers due to its strong global presence and service infrastructure. In July 2016, Intertek developed new technology for honey authenticity testing, which is based on NMR (Nuclear Magnetic Resonance) spectroscopy. In May 2016, Intertek launched its AgriTech laboratory at Hyderabad (India) to perform DNA-based testing of various agricultural products. The company introduced its advanced ScanBi DNA testing technology in India with this expansion. 10.4.2.3.4 Haccp Regulation in the U.S.
10.4.2.3.6 GMOs Regulation in U.S.
12.6 LGC Science Group Ltd.
12.11 Genetic Id Na, Inc.
*Business Overview, Products Offered, Recent Developments, MnM View, SWOT Analysis, Key Strategies Might Not Be Captured in Case of Unlisted Companies.